These data have been published by the 2017 Global NGO Online Technology Report, in which more than 4,908 NGOs from 153 countries were surveyed. 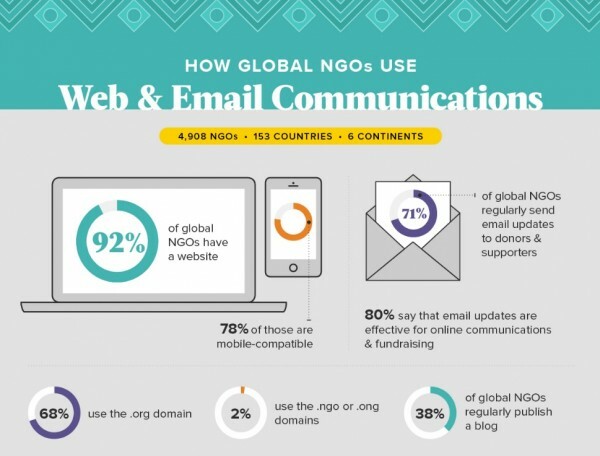 The organisation Nonprofit Tech for Good has published the 2017 Global NGO Online Technology Report, highlighting some data such as the fact that 92% of NGOs in the world already have a webpage or that 67% of them accept online donations. The report is the result of a research conducted in more than 153 countries from five continents through almost 5,000 non-profit organisations. The objective is to know how NGOs around the world make use of online technology to communicate and attract new members. The report is structured in three main areas: web and email marketing communication, the use of smartphones and online tools to raise funds and the use of social media. In the first place, we can see that 71% of NGOs regularly send emails to their members and supporters. On the other hand, only four in ten NGOs have a blog and almost 80% of them have a website that is mobile and tablet compatible. As far as fundraising tools are concerned, almost 80% accept credit card donations; 50% through PayPal and only 42% of them through debit card. It is important to emphasise that only 1.5 out of 10 NGOs send texts to its members and supporters on a regular basis. 92% of NGOs have a Facebook page. 72% have a Twitter profile. 39% have an Instagram profile. 55% have a YouTube channel. 51% have a Linkedin profile. The Global Online Technology Report is available in English, French and Spanish. The research has been sponsored by Public Interest Registry, a non-profit organisation from the United States created to manage the domain .org in 2003, and the domains .ngo and .ong in 2015.